The exhibition puts on display the selection of the most representative works made by prominent Italian photographer Mario Giacomelli. In 1995, C.R.A.F. acquired the Luigi Crocenzi’s archives consisting of very important letters, books, and photographs that Crocenzi collected during all his life. Among the photographs there are more than 250 vintages realized by Mario Giacomelli from the 1950s till the end of the 1970s. Giacomelli’s discourse became symbolic when his photographs exasperate the emotive aspect of the reality. The exhibition puts on display the selection of the most representative works made by prominent Italian photographer Mario Giacomelli. His discourse became symbolic when his photographs exasperate the emotive aspect of the reality. As Federico Fellini for cinema, Mario Giacomelli overturned the Neorealist point of view introducing in his photographs a new tonal poesy, almost dreamy, and producing photographic stories where he excluded unnecessary details. Then he became the most important Italian photographer of the 20th century, independent from every school of thought. In 1995, C.R.A.F. acquired the Luigi Crocenzi’s archives consisting of very important letters, books, and photographs that Crocenzi collected during all his life. Among the photographs there are more than 250 vintages realized by Mario Giacomelli from the 1950s till the end of the 1970s. In the first part of the exhibition the visitor can observe the series of photos taken during the 1950s: First photographs, Nudes, Sea, Landscapes, Apuglia, Land people, Lourdes and Scanno. In the second part, one can admire some masterpieces from the series Slaughterhouse (1961), I have no hands that caress my face (1962-63), To Silvia (1964), The Good earth (1964-65), Motif suggested by the cutting of a tree (1967-69), Death will come and will have your eyes, Caroline Branson (1971-73), Students (1977). Mario Giacomelli (Senigallia, 1925-2000) began working at Tipografia Marchigiana when he was only 13 years old and he worked here during all his life. He devoted himself to photography, first only during his leisure every day after dinner near Senigallia, then learning to print his photos himself. In 1955 he was awarded in Castelfranco Veneto and in Spilimbergo. 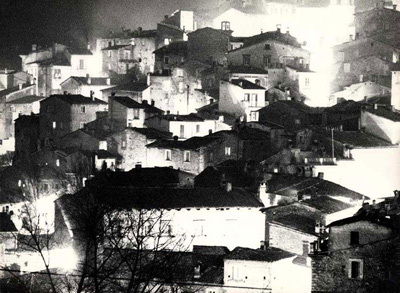 When John Szarkowsky, curator at MOMA in New York, bought in 1963 for the Museum the series of photos untitled Scanno and introduced one of his photos in the prestigious catalogue Looking at Photographs, Giacomelli became famous in Italy and abroad.